Brendan Howlin is a Druid grade member of the order of Bards, Ovates and Druids (OBOD). He has been Senior International Tutor for Bards and Ovates for 13 years, and Science Correspondent for Touchstone, the journal of OBOD for 13 years. He is also co-founder of Surrey Druid Grove. Brendan is also Director of Postgraduate Research at University of Surrey. I’ve been fascinated by his upcoming book, The Handbook of Urban Druidry, and set out to find out a little more from the author himself. Mabh: I think when most of us consider Druidry, we don’t often think of the term ‘Urban’ as being associated. Can you tell me a bit about how and when you started considering the ideas within Urban Druidry? Brendan: The ideas in Urban Druidry basically grew out of my many years tutoring bards and ovates for The Order of Bard, Ovates and Druids (OBOD). I have tutored people living in flats who have had to lean out of the window to even get a glimpse of the moon! So I realised that the tenets of Druidry needed to be more widely applicable if more people were going to benefit from them. Everyone would love to be able to spend hours meditating in a beautiful forest but this just isn’t possible for most people these days. Incidentally, I’ve just been impressed by the beauty of Zurich, definitely an urban place, from a correspondence with a recent tutee. MS: Who will get the most out of this book? Was it written with any particular group or type of person in mind? BH: In OBOD we are celebrating our golden anniversary this year. So for the last 50 years we have been working on ourselves (not me personally of course!) and it is about time to bring this to a wider audience. People who read the book aren’t required to become Druids, although I would hope that some would but I would hope that most could benefit from it. Many Pagan books and books about Druidry are very esoteric and academic and are preaching to the converted in a way. I wanted to show that these ideas are open to all. Living a spiritual life is conceptually very easy but practically very hard to do, it’s a paradox. Having said that about spirituality, there is often a po-faced attitude to spirituality, whereas, most spiritual people smile and laugh a lot, so I wanted to present it as fun too. MS: Do you need to be a druid to benefit from the ideas in Urban Druidry? BH: No, you don’t need to be a Druid, the ideas presented are simple, require no special beliefs and can be done by anyone in 5-10 minutes a day. The idea is to awaken people to what is going on around them. Many people would say that there is a deep spiritual malaise in the wider society, the pursuit of money in a secular world is deeply unsatisfying in the long run, so this is a wakeup call. MS: What attracted you to druidry in the first place? Have you always been on a spiritual journey here, or was it a sudden change in your life? BH: Looking back I think I was always on a spiritual journey but it is deeply unfashionable to say that as a scientist. I come from what would be called a broken home these days, so was searching for meaning from an early age. I thought that the rationality of science would give me that but from self-help and meditation I progressed steadily to Druidry. About 15 years ago every book I picked up mentioned Druidry, so it piqued my interest. My wife bought me ‘The Book of Druidry’ by Ross Nichols and I must confess I found it very hard going. It wasn’t until I read ‘The Druid Way’ by Philip Carr-Gomm that I realised this could be a living spirituality and I took the plunge and joined OBOD. MS: Do you find your practices as a druid complement your scientific studies and teaching, or vice versa at all? BH: Actually they do complement each other. Our departmental secretary said, several years ago, when I came out as a Druid, that she wasn’t surprised as I was the most spiritual person she had met! The stability and calmness that Druidry gives you helps with the rough and tumble of academic life. Academia these days is extremely competitive, all about meeting targets and less about scientific freedom, so as I say the chance to meet accepting people outside and relax is very valuable. MS: Some might say that being a druid and being a serious scientist are at odds with each other. How would you respond to that? BH: An interesting question, Penny Billington who is the editor of the Druid journal Touchstone, made me scientific correspondent about a dozen years ago and I write articles on where science and Druidry meet and touch. As far as I know I’ve only upset one person and only had one article rejected for the same reason. Last summer at the OBOD gathering, I was invited to talk about something simple like light, energy and the origin of the universe and the latest scientific evidence for the light body. Our Chosen Chief said it was illuminating! The talk went down really well and people mailed me afterwards because there was a program on the telly about the seven ages of stars and it made sense to them. I am lucky in that my science involves computer graphics and modelling, I don’t make anything and I don’t destroy anything. I am surrounded by beautiful art on a daily basis. It might be harder if I were in another area but I do know several scientist Druids. MS: And do you ever come across this attitude in either of your practices? BH: Not really, the Druids of old were philosophers and rational beings just like scientists should be. The point of being a scientist is to have an open mind but scientists are as prone to prejudice and entrenched views as anyone else. I was somewhat taken aback by the interest and support I have received for the book from scientist colleagues and friends. One older scientist colleague even shared with me his experiences of dowsing at Stonehenge! My Druid friends have always been really accepting. MS: How important is it that we update our understanding of terms like Druid and Pagan to make them relevant to modern society? BH: I believe there is a lot of misunderstanding about the term Druid and Pagan in wider society, mainly caused by the more flamboyant members of our community but OBOD also has sweet little old ladies in tweed skirts amongst its members. In fact there are many Druids who would not call themselves Pagan. Having Druidry classed as a religion has done us a disservice, it is good for those who follow a definitely Pagan path but for those who wish to follow a nature based spirituality it is off putting. There is no concept of Deity in Druidry, it is entirely up to you, so we have Christian Druids, Pagan Druids, Buddhist Druids and secular Druids. I believe there is room for all views and in a spirit of tolerance we can all coexist happily. MS: Is there one thing anyone can change about their life to be closer to nature? BH: Yes, I mention this in the book as the first exercise….learn to see. Open your eyes and see the life going on around you. The most urban of environments teems with life. If you raise your head from your mobile phone, take out your earphones and see and hear what is around you, you will become closer to nature. MS: Do you ever find yourself in a place that feels so disconnected from nature or the world that it leaves you feeling lost? How do you deal with this? BH: The beauty of Druidry is that we all have what is called our internal sacred grove that we can retreat into to feel secure and at peace. After you have been practicing this for many years you can connect to it anywhere. MS: It seems that recently there has been a rise in the interest in Druidry. Why do you think this is? BH: The link between nature and humankind has been broken and people unconsciously realise this. The one thing that we can know about this life is that we are here and as we are here we must interact with what is around us. You must have felt yourself in the depths of winter that you would rather curl up and sleep. This is natural, our bodies and mind have evolved with the cycle of the year and our 24/7 lifestyles are just wrong. The rise in interest in Druidry is due to this and the dissatisfaction with the endless pursuit of money, status and power that I mentioned earlier. MS: Can you be a druid if you never get out of the city? BH: Yes you can, in any case no one knows what a historical Druid actually was and consequently every age has invented the Druidry that suits them. However, cities are full of trees, wonderful tree lined avenues, marvellous cloudscapes, plentiful bird life. There is a lot of evidence that exposure to green space, even parks, canal walks, etc. serve to prolong our lives. MS: Are you planning any more books? BH: This is my first venture into the world of ‘real’ publishing, having only published scientific papers beforehand, so I would like to. I am really grateful for Trevor Greenfield of Moon for believing in the book. It really depends on the success of ‘The Handbook of Urban Druidry’, as Druids love things that come in threes! 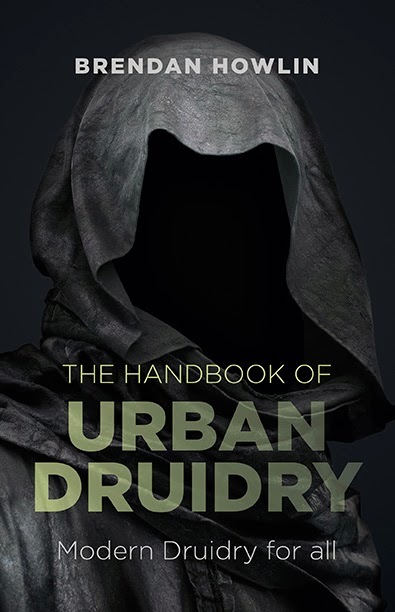 I would like to invite readers to email me on urbandruid1@gmail.com with their experiences of urban druidry and I will put the best on my website (www.urbandruidry.com). MS: And finally, describe your perfect way to unwind and lose the stresses of a hard day. BH: I love walking in the Chantry Woods near my home. We are five minutes’ walk from both the High Street and the North Downs. Guildford currently just ends at the Downs and you can walk to Canterbury on the downs if you wanted to. So I would walk down the path from the Downs and through the woods and just feel the peace and relaxation. There is a saying that a Druid is the landscape where they live and I truly am the Druid of Chantry Woods. Brendan’s book is out on 28th March 2014 and available from all good book retailers including Amazon. Visit his website to learn more.